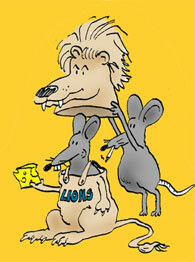 HARD HITTING DETROIT LIONS FORUM - View topic - NFC NORTH Draft Rankings. Re: NFC NORTH Draft Rankings. I really think the Vikings drafted two guys in the first round that are more likely to turn out to be total busts. I'm not defending Mayhew here, but I think people are doing a bit of wishful thinking when they analyze Mayhew vs other GMs. Much like free agency, where we tend to think guys coming from other teams are great because we've only seen their highlights (while we see all the good and bad for Detroit, so we know the relative merits of each player), I think people are viewing other GMs too positively. There was an article on FiveThirtyEight recently that showed that pretty much every team is hit or miss with their draft picks. The only GMs in recent history to buck this trend over a 3 year period were Ron Wolf (Green Bay), A.J. Smith (San Diego), and Bill Polian (Indy), and even they were fired after their teams went downhill. My point is that when we think about possibly replacing a part of the Lions organization, we tend to have a "grass is greener" mentality. I think it stems from the fact that we are paying close attention to the team. But if we paid as close attention to the other teams around the league, we'd see that almost nobody is doing it better. It doesn't mean that Mayhew should keep his job if the team doesn't produce. It just means that his performance probably isn't quite as bad as we think, and getting someone else most likely would generate a similar level of performance. Great article, thanks. And great post on BPA, too. Agree. Barr is a one trick pony and Bridgewater, though talented, is one Peppers/Suh/Allen hit away from broken. After more than a week of listening to commentator after commentator talk about each teams drafts on Sirius/XM NFL Radio, I have to change my initial ranking because everyone loves the Lions draft followed by the Vikings and Bears and Packers. I have to admit that I was not happy with a TE at #10 overall. But, I guess he is more of a WR. Lets just hope the Saints and Graham get this tag situation figured out because it could affect us in the future.